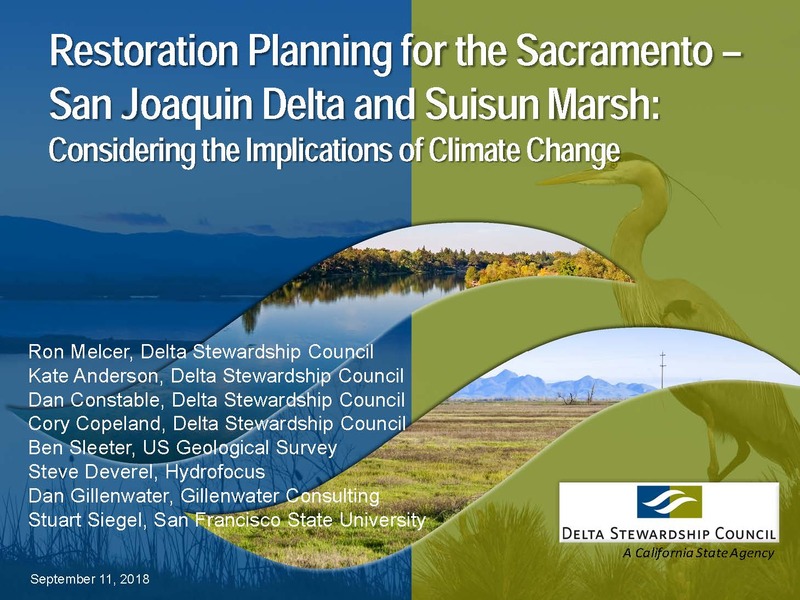 The Delta Reform Act requires ‘taking into consideration the physical changes that have occurred in the past and the future impact of climate change and sea level rise’ for restoration planning. 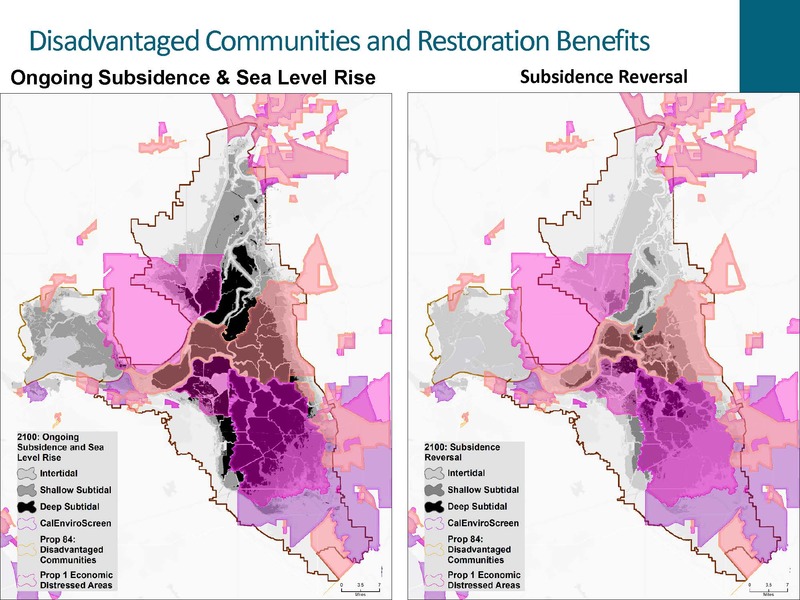 Re-establishment of tidal marsh is critical to restoring food web function and increasing the extent of habitat for fish and wildlife within the Delta and Suisun Marsh; however, land subsidence, sea level rise, and urbanization significantly constrain where tidal reconnection is possible in the future. A team of Delta Stewardship Council staff, scientists, and consultants have been working for the last year on the effects of climate change on restoration projects in the Delta, and have been compiling information and putting together fundamental datasets to inform the ecosystem restoration amendment to the Delta plan, the development and refinement of performance measures, and to provide the foundation for a climate vulnerability assessment currently underway that will be completed in 2020. At the 2018 Bay Delta Science Conference, Ron Melcer, Senior Environmental Science Supervisor, gave a presentation on what the team has accomplished so far. Mr. Melcer began by reminding that the Delta is the largest estuary on the West Coast of both North and South America. 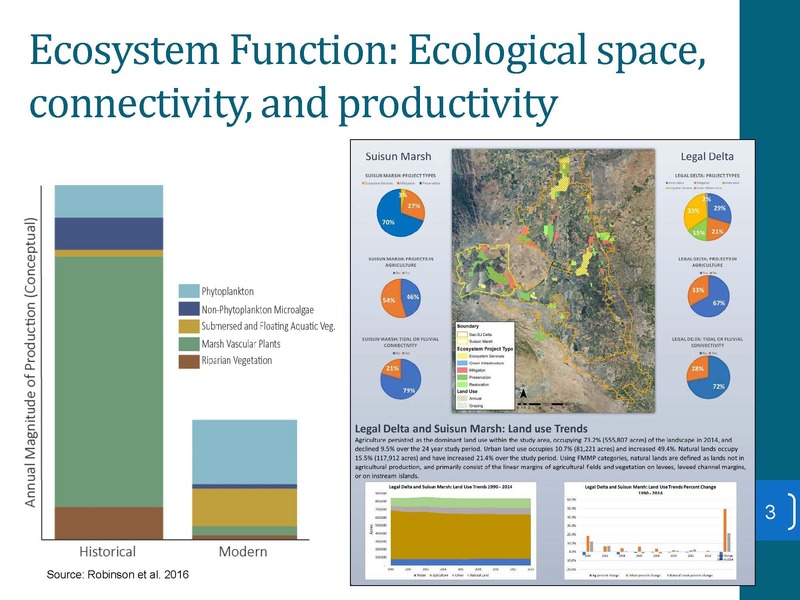 Within Western North America, the riparian, wetland, and estuarine ecosystems are both incredibly productive and support more than 80% of the biodiversity on the arid and semi-arid landscape. 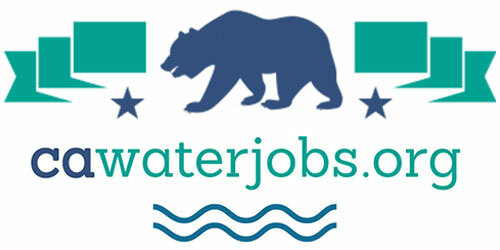 The Delta connects California’s largest river system from their montane headwaters to the ocean. It’s projected to be an important region for ecological adaptation to climate change, with its multitude of stream channels and marine influence causing cooler temperatures on the landscape. 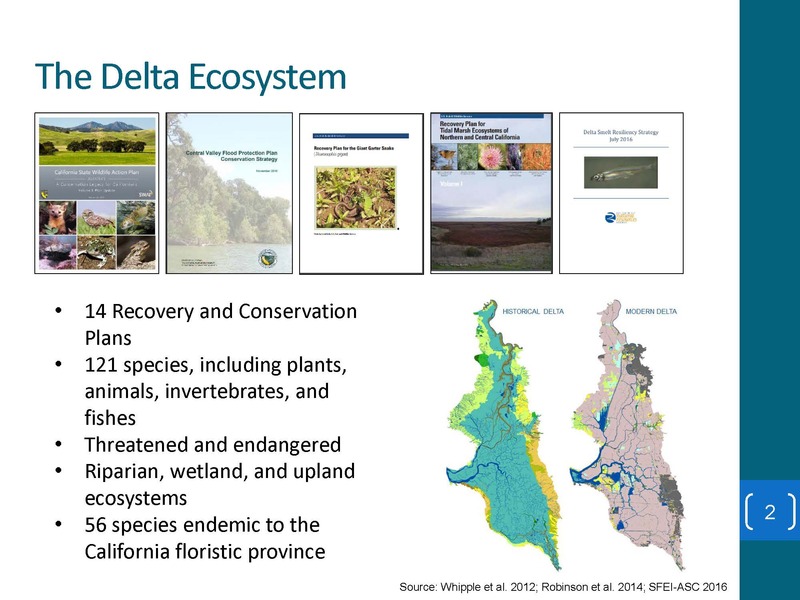 The Delta is significantly impaired due to the disconnection of the land-water interface, significant loss of native vegetation and many other stressors. Currently there are well over 100 species of conservation concern; nearly half of these are endemic to the California floristic province. The Delta is one of the top 25 biodiversity hotspots in the world. Mr. Melcer noted that there are at least 14 conservation and recovery plans that exist which provide ecological goals and objectives for the region. 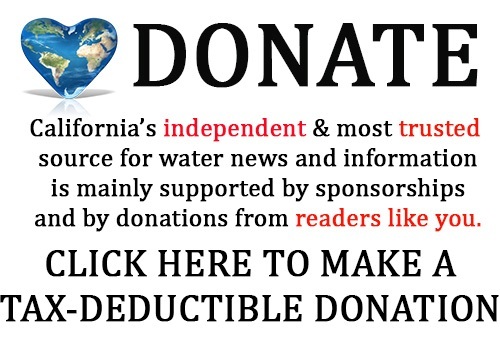 “And so given the level of scientific inquiry in our investments on the landscape within the Delta, it’s really hard to reconcile that we’re still in a very impaired state,” he said. 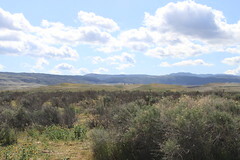 Given the conservation and restoration to date has largely focused on protection of remnant habitats or the implementation of multi-benefit projects, such as vegetation on levees or wildlife friendly agriculture, they have been focusing on the elements of conservation that have yet to be implemented, such as reestablishing the physical and biological processes that support key ecosystem characteristics at multiple hierarchical scales. Over the past year, the team has been acquiring, assessing, and updating models and datasets. 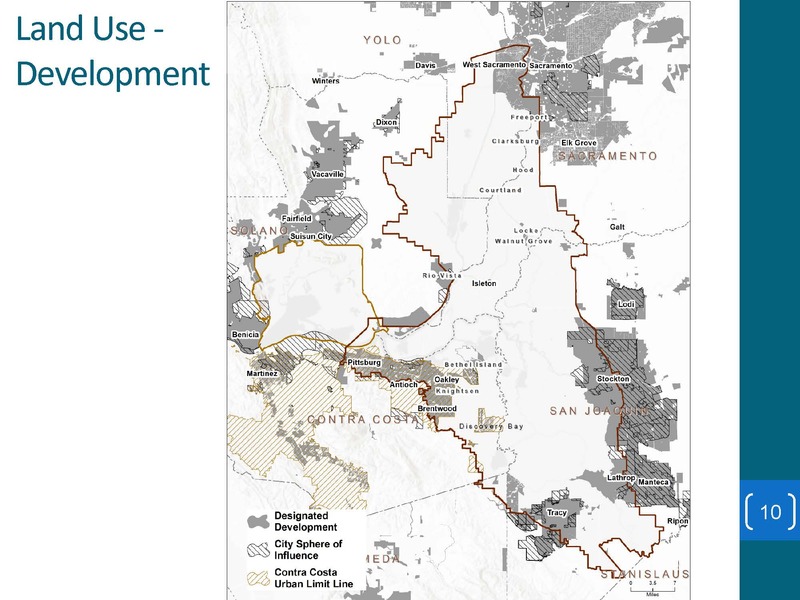 They have focused on how to achieve two coarse outcomes on the landscape which tie back to the Delta Stewardship Council’s authorities related to land use and infrastructure throughout the Delta: the restoration of native vegetation communities and the concept of reconnecting tidal or fluvial land-water connections. From a process-based restoration perspective, there are two key geomorphic drivers for the connection of the land-water interface: Landform and the flow of water. 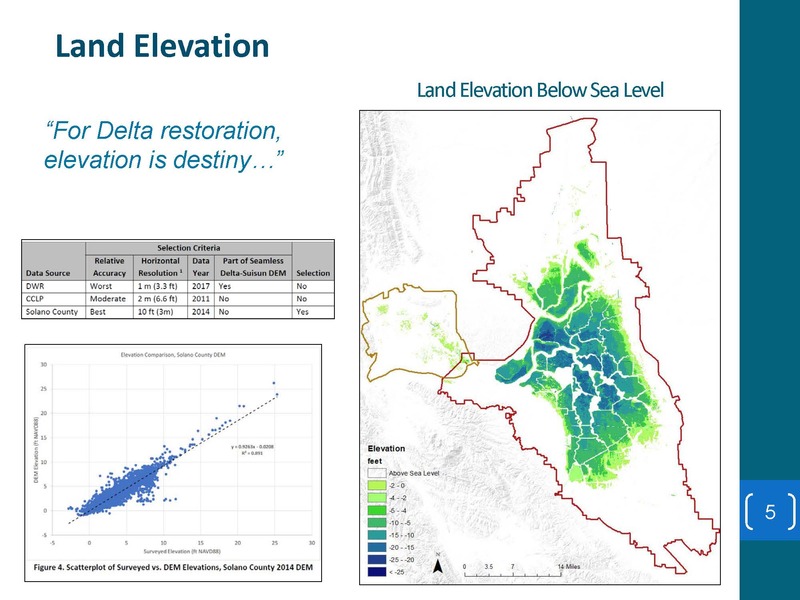 Elevation within the Delta presents significant constraints on the potential for restoration. 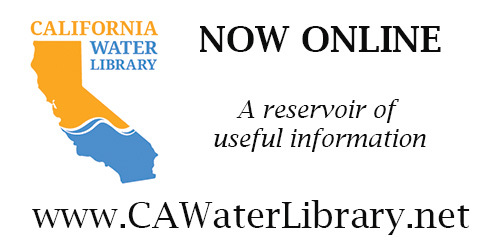 The California Natural Resources Agency and the Ocean Protection Council released sea level rise guidance in 2018. 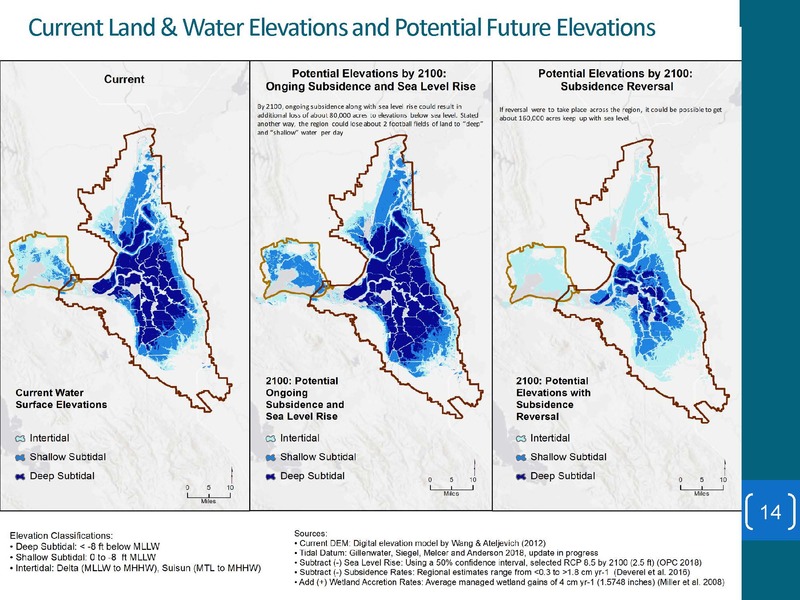 The team is evaluating scenarios which include an optimistic, a likely, and an extreme scenarios for sea level rise, which correspond with 2.5, 7, and 10 feet of sea level rise at the Golden Gate respectively. Water surface elevation gradients within the Delta are complex. 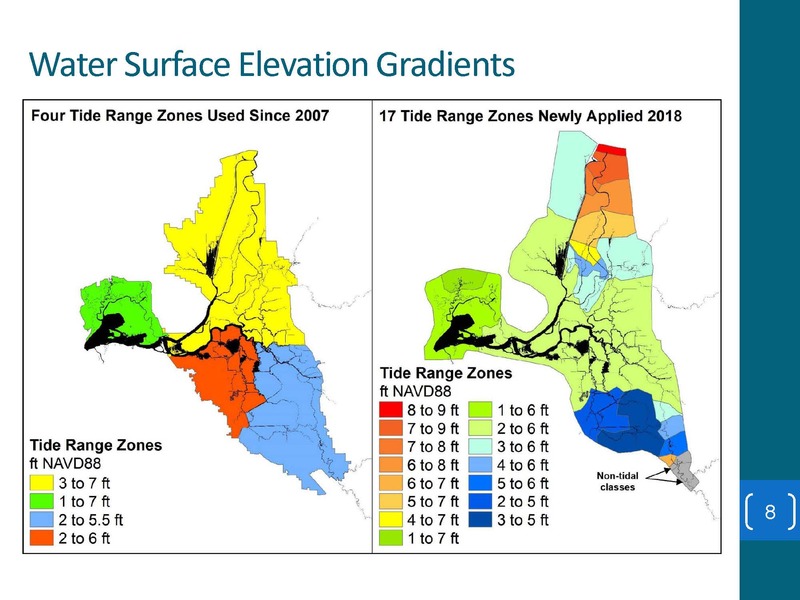 They have been working to refine the understanding of how river flows and tidal forcings interact within the estuary and they’ve undertaken a relatively static analysis which leverages more than 40 tidal datums across the estuary. 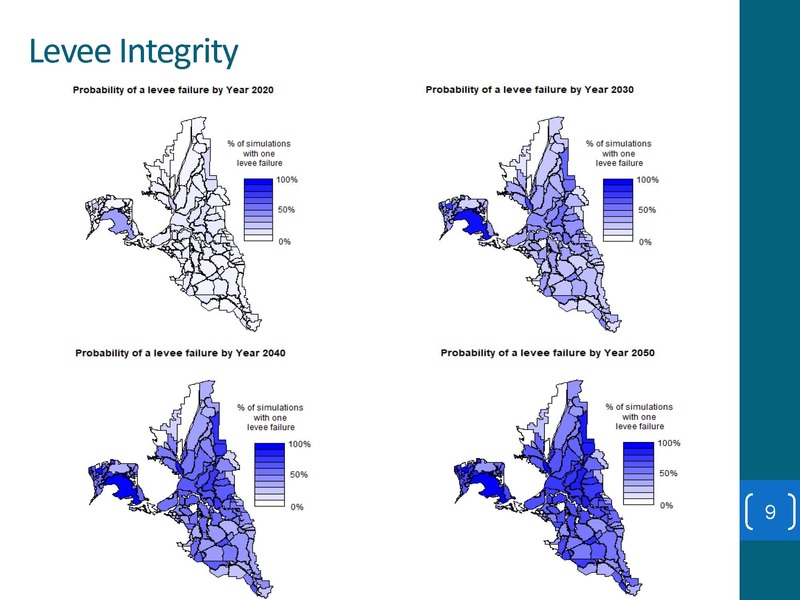 They have also been applying fragility and failure rate datasets from the Delta Risk Management Study and the Council’s Delta Levee Investment Strategy dataset, and they’ve recently received an empirical failure dataset for the region that they will utilizing. 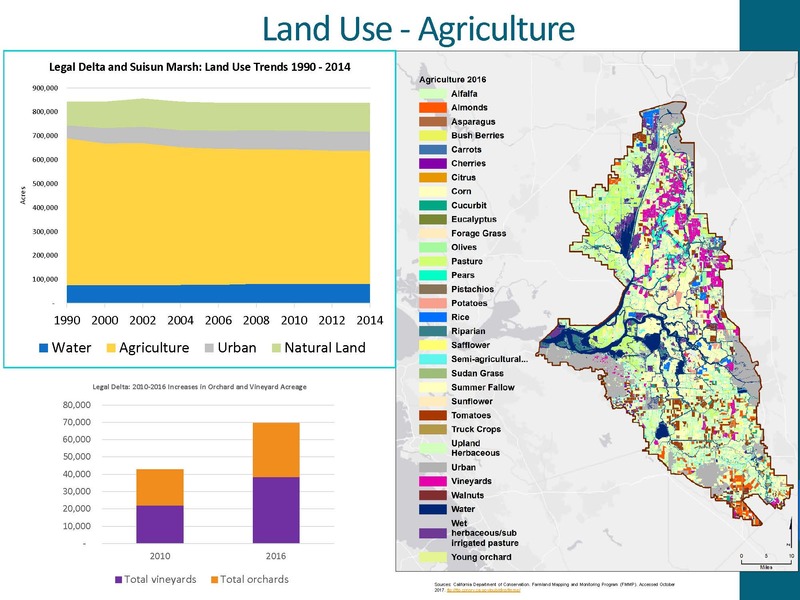 They have also been working with the counties to compile a baseline understanding of the build landscape as of 2013 when the Delta Plan and its development policies were adopted. They have gathered existing local government plans and the existing land use for both the built working landscapes and natural lands. They are also currently in the process of supporting the Department of Fish and Wildlife and other organizations in the updating of the VegCAMP dataset based on 2016 NAP aerial imagery. Mr. Melcer also noted that they’ve been working with the San Francisco Estuary Institute in supporting the use of the resilient landscapes reports. 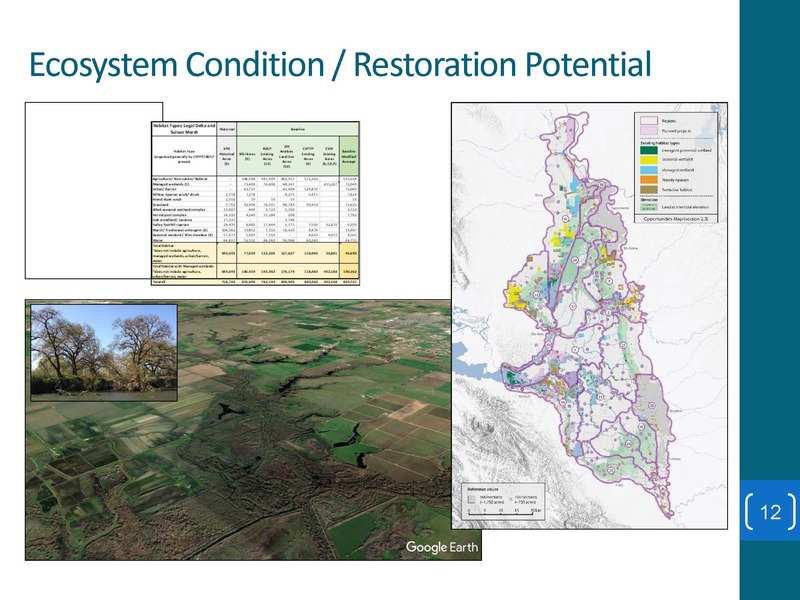 They have also worked with a colleague in Tacoma to develop grid-based forecasting models which evaluate both the changes in land elevation and water surface elevation while also considering changes in land use to give an understanding of potential future conditions within the Delta. 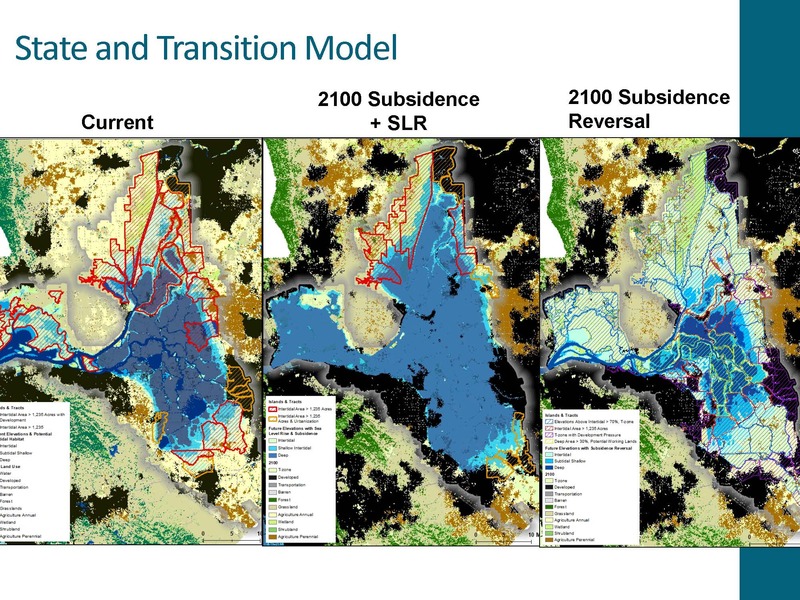 The slide shows three scenarios: current conditions, business as usual scenario in the center, and the strategic levee maintenance and subsidence scenario on the right. 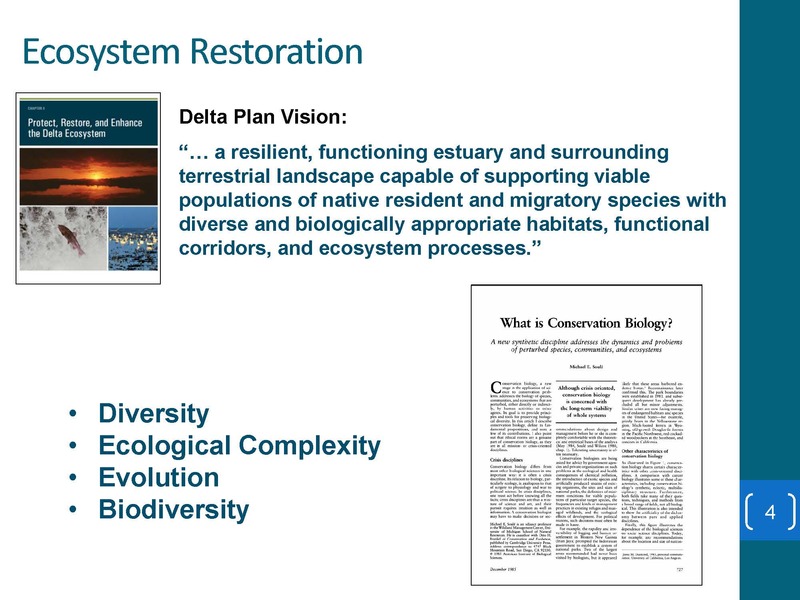 The work that the team is doing will inform the ecosystem amendment to the Delta Plan, which includes refinement of regulatory policies and recommendations that address considerations of climate change in restoration actions. He noted that the Delta Plan has a policy that requires restoration proponents in the Delta to place their projects in appropriate elevation zones. Some of the work they have been doing has been used to update this figure with a more nuanced look at those interactions between fluvial and tidal flows, with the new proposed figure shown on the right. 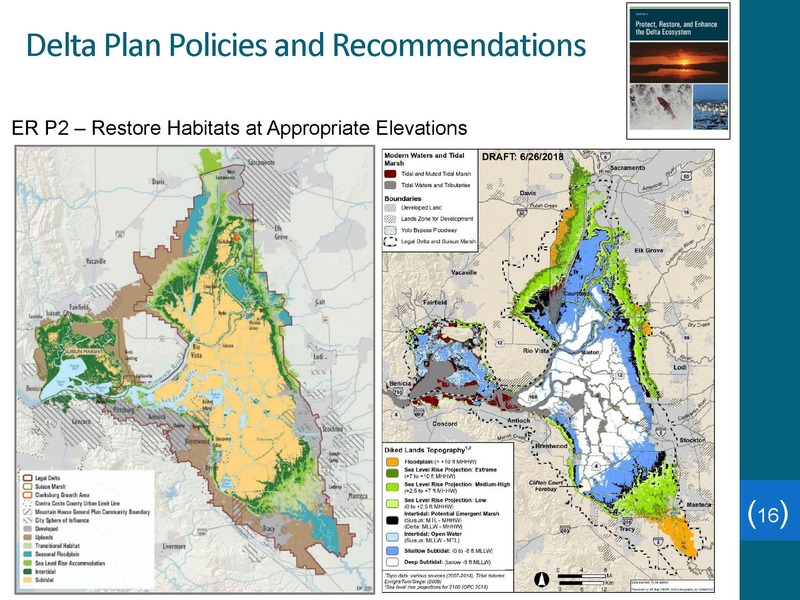 “We have an opportunity to refine how we are measuring success within the Delta in achieving the ecosystem vision of the Delta Plan, so these data and models provide a basis for the development of performance measures, both the baselines and the targets within the region,” he said. 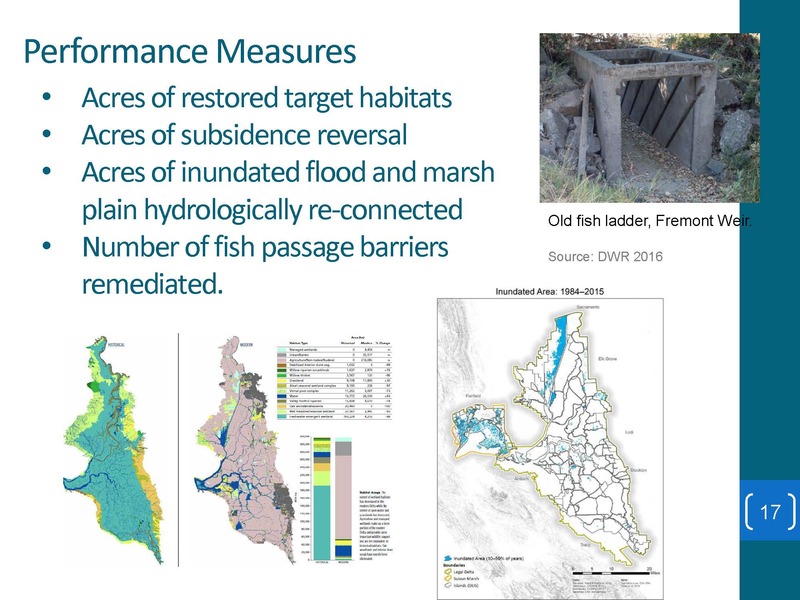 “These include assessing habitat restoration, fish passage improvements, reconnection of land-water interface, and the reversal of subsidence. 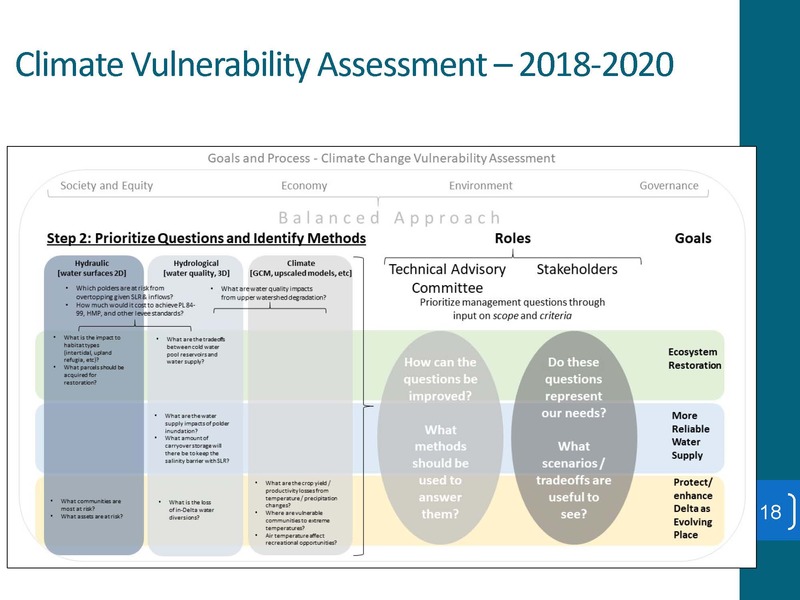 They are embarking on a climate vulnerability assessment and adaptation strategy, and this work provides a foundation for the effort which will proceed over the next three years. For more presentations from the Bay Delta Science Conference, click here.